The stage is set, the fighters have weighed in, the experts have taken their sides, and now it is time for our breakdown and prediction for tomorrow’s big showdown between Bernard Hopkins and Sergey Kovalev on HBO from Atlantic City, NJ. The phrase “never bet against Hopkins” still dwindles away in my mind as I write this. While my prediction for this fight has been set in stone ever since I dreamed about it happening over one year ago I still have doubts. As confident as I am, and have been for the past year, something in my mind makes me think that I am going to be wrong. Bernard Hopkins knows it too. As much as he likes to get into his opponent’s head before fights, he’s in my head as I write this article. "I've done so many unpredictable things and so profoundly. Even the people who want to go against me, are afraid to go against me. They've been wrong so many times. A lot of them are just being mum right now. They must feel I can still do things.”-Bernard Hopkins. I feel like Hopkins was talking to me directly when he said that. I for one, have usually bet against Hopkins when he was the underdog. And I have been wrong almost every time. I thought Shumenov would beat him, I picked Cloud, I favored Kelly Pavlik, I gave De La Hoya the edge, and I thought Felix Trinidad would obliterate him. Every single time I was wrong. So tomorrow night when Hopkins and Kovalev square off I will have my doubts again because I am picking Sergey Kovalev to beat Bernard Hopkins soundly. I think Kovalev’s most underrated punch is his jab which he is going to use to get to Hopkins all night. He’s a pressure fight but he usually comes in behind a stiff jab. He can throw short punches with power that have knocked his opponents out. That is going to be key in this fight because it’s not likely he will land big shots from the outside against Hopkins who will be moving the entire night. Kovalev has had trouble with speed and movement before. He could have an issue with that tomorrow night however I think the speed edge belongs to him because of the way Hopkins fights. Bernard is going to hold a lot and try to fight on the inside as he holds. He’s going to throw that right ducking his head as he comes in for the grab right after. Everything that Hopkins can do to make this fight ugly he is going to do because that is the only way he is going to win. However, Hopkins has found himself in some fire fights lately. I think he will try to go toe to toe with Kovalev a few times. 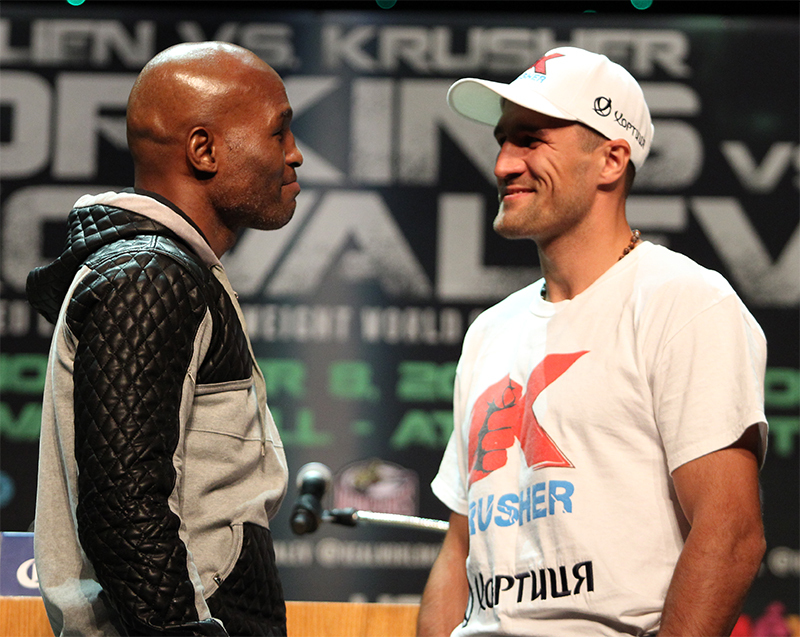 I can see Hopkins getting dropped once or twice in this fight but I don’t know if Kovalev knocks him out. Hopkins has been in a lot of favorable match-ups as of late. That is not taking anything away form him being able to compete at this level at the age of 49 years old. What he has done in the past five years as been nothing short of miraculous. Tomorrow night though I think he is up against a different breed of fighter that is finally going to expose an old Hopkins who won’t be able to keep up with the pressure and punches of Kovalev. Yet, as I finish this last sentence in my head I can still hear Hopkins saying what he said at the press conference, I can still hear the phase “never bet against Hopkins” playing over and over. My pick is Kovalev…I think.